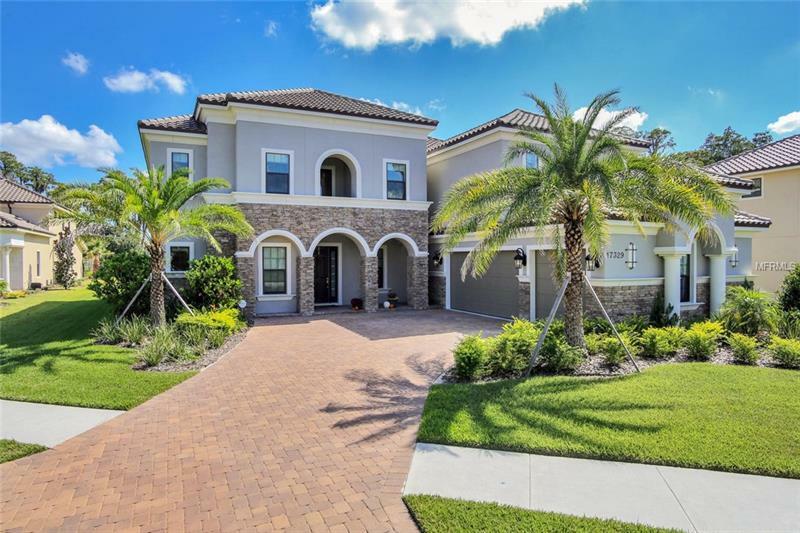 17329 Ladera Estates Boulevard, Lutz, FL.| MLS# T3136449 | Westchase Real Estate - Westchase FL Homes For Sale - Westchase Local Experts. BRAND NEW!! This Exquisite two story home is situated on one of the largest lots in Ladera (.66 acres) and was built in 2018 by Taylor Morrison (The Avondale). Boasting 6 Bedrooms 4 Full Baths 2 Half Baths Office and 5372 sqft of living space! Immediately upon entering be greeted by soaring ceilings and timeless Engineered Hardwood Flooring that flows throughout the 1st floor! KITCHEN(18x21) is equipped with GE Monogram double ovens LG Smart Wifi InstView Refrigerator Gas Range Farmhouse Sink Prep Sink Quartz Countertops 42inch Cabinets finished w/ Crown Coffee Bar and a custom over-sized Walk-In Pantry. GREAT ROOM(18x22) offers Vaulted Ceilings and pocket sliders that open to the patio/pool area. MASTER(13x22) boasts double Crown Molding w/ Tray Ceiling dual over-sized Walk-In Closets and soothing views of the backyard/lake. MASTER BATH is completed w/ dual sinks large vanities w/ quartz countertops and a prodigious shower w/ 2 shower heads [+] a wand. Completing the downstairs is a GUEST SUITE(11x13) w/ an en suite bath (also serves as pool bath) and a vast laundry room. Upstairs offers 4 generously sized bedrooms w/ ample sized closets MEDIA ROOM(15x17) and an open LOFT(22x27) w/ Wet Bar. Step outside to your private screened/paver lanai enormous Swimming Pool/Spa Outdoor Kitchen and over-sized backyard situated on Lake Merrywater! ADDITIONAL FEATURES include Crown Molding throughout 8ft Solid Wood Doors Central Vacuum over-sized 3 car garage and Community Park/Fishing Pier.